Y’all, I’m in full Thanksgiving/Holiday mode! OMG. Already!? It’s only five weeks until the start of holiday season, and although I’m not hosting, I still love all the holiday food this time of year brings. I’ve been preparing like mad so I can share fabulous recipes with y’all but am in need of a kitchen housekeeper. I’m cleaning more than I’m cooking! aaaack! Get ready for holiday food from now until December 25! Any special requests? Tell me now! I’ve been contemplating carrot tops for quite some time. Not really wanting to waste them, but I hadn’t been thinking about a way to use them. I hate food waste. Through the summer and early fall, our CSA farm takes vegetable scraps for composting. They have chickens and turkeys that love discarded veggies, and there’s a system in place for handling compost. But we’re nearing the end of our CSA and I’ve got to do something with carrot tops other than throwing them out. I understand they’re good for us too, not toxic, as I once thought. So, I started putting them in smoothies. I didn’t get any scrunchy-nose looks from Rob either. Carrot tops are definitely not regular (his word) in our morning smoothies. 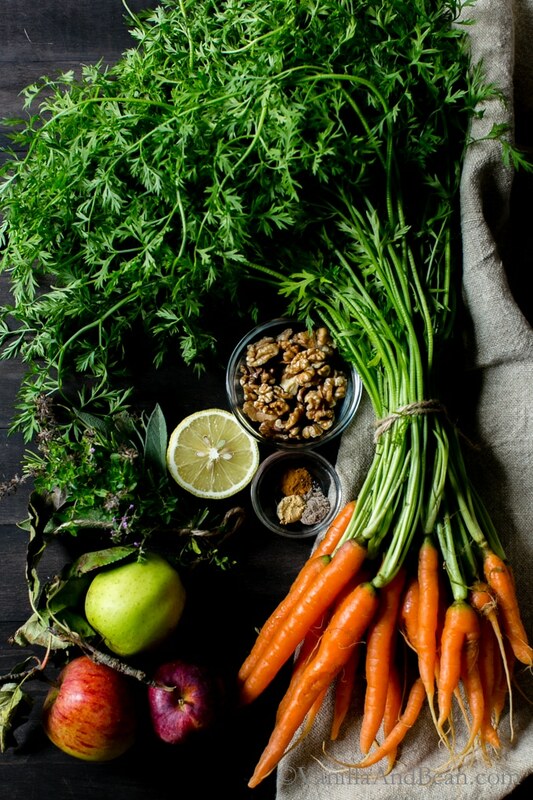 The Kitchn has accompanying resources about carrot greens. Last week at the farm, I picked up a big bunch of carrots. I’d never seen such a beautiful bouquet in my life. They were the ideal size for roasting with minimal cutting or slicing. My inner lazy girl was speaking. Apples and carrots are fabulous together. I sprinkled on cardamom, cinnamon and ginger to spice things up with finely chopped walnuts, a squeeze of lemon, and fresh herbs. For the nuts and herbs, use what you have on hand. I used walnuts here, but pecans would be a delight too. My herb pots are still growing thyme and rosemary, so I tossed in a few teaspoonsful, chopped fine. Sage and/or parsley would be a delicious alternative. 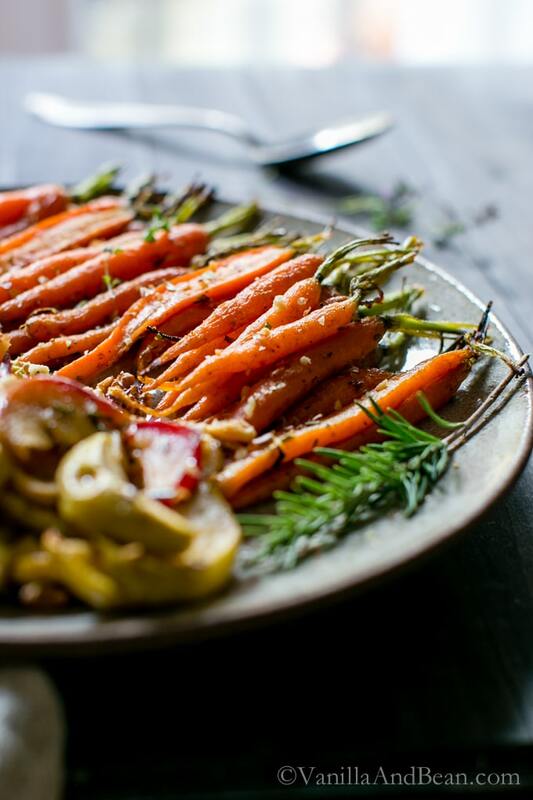 For an easy holiday side that packs in a little sweet, crunch, and spice, carrots and apples are a delightful combination. Double the recipe to feed a small crowd. Have you started preparing for the holidays? Are you hosting? What do you do with your carrot tops? Any tips? Preheat oven to 425F (220C) and place rack in upper third of oven. Line two sheet pans with parchment paper. Place walnuts in a pan and toast while the oven is preheating for about 15 minutes or until toasty and fragrant. Set aside to cool, then chop fine. 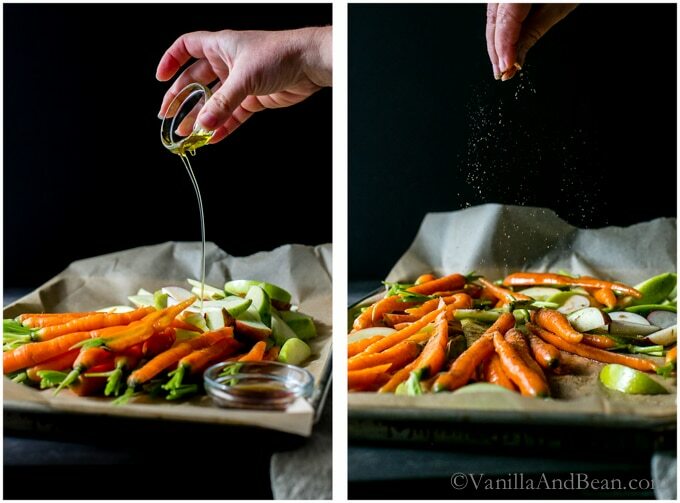 Toss carrots and apples with olive oil and maple syrup. Sprinkle with spices. Toss again to evenly distribute the spices. 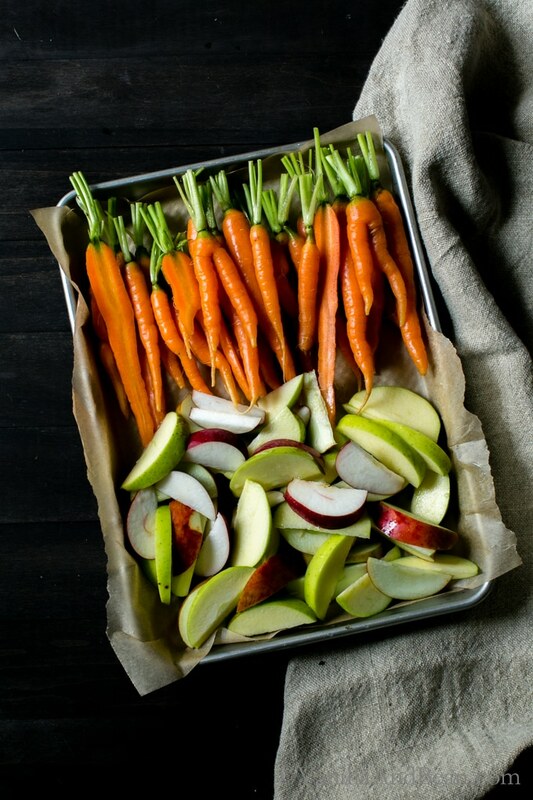 Spread the carrots and apples in an even layer, on each prepared sheet pan making sure not to crowd the carrots and apples. Roast for 20 minutes, gently flip the carrots and apples 1/2 way through roasting.Test to see if the carrots and apples need more time by checking for fork tenderness. I prefer tender crisp carrots. If more time is needed, give them another five or more minutes. Thicker carrots will need more time. Right out of the oven, sprinkle with lemon juice, toss with fresh herbs and season with sea salt. Serve immediately or chill and serve on a salad, as a snack or cheese plate. *Look for carrots that have their tops. This ensures fresh carrots. Also, look for carrots of similar size. Before roasting, and if needed, cut the carrots so that they are of similar size so that they'll roast evenly. Hope you had a wonderful Thanksgiving, Traci!! I am gearing up for my Christmas trip to England, and of course, I’m not ready to leave yet! I just saw your oatmeal cookies with whiskey currants recipe, and I can’t wait to try it there! I don’t think I”ll be able to find teff, but I’m sure I’ll find something that I can sub it with. Hope you are staying warm! Hey Lisa! What fun… Christmas in England! Look for Teff where you find Bob’s Red Mill. I thought I’d have difficulty finding it, but have found at at two stores I shop on my Island home (I was surprised!). You’ll love those cookies, Lisa! It’s freezing here.. we just got a few flurries today :D .
This looks amazing! If anyone is better than me at sizing up, I’m going to make this for 30, not three! (I could use a little math help!) Thanks! Look at those adorable little carrots! I just love them. Apples + carrots + cardamom, oh my goodness, perfection. I am going to make this tomorrow with some chickpeas and I can’t wait. This is such a beautiful dish, Traci! I love the combination of apples and carrot – a sweet side dish that I would most definitely gobble up :) I can’t believe it’s almost the holidays – I wish I was spending them at your table so I could have all your beautiful goodies! 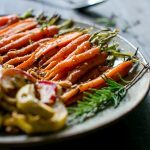 Loooove the cardamom in this Traci and these carrots are just GORGEOUS! I don’t think I’ve ever had carrot tops in my life! I should change that. My inner lazy girl is alive and kicking :) This needs to be on my Thanksgiving table!! Thank you Karen.. Cardamom is a newish to be spice (in the past two years) but oh my, I’m like, where have you been all my life?!!? Try those carrot tops, Karen.. but first in a green smoothie. Glad to hear your in the lazy girl’s club.. I hear mine way too much! hehe! Such a beautiful fall dish! I could easily eat this as my main course! Amazing use of color (and spices)…beautiful photography! Hehe.. no doubt, this is so filling. I ate it chilled, for lunch the following day! Thank you Donna! This is such a gorgeous side dish, Traci! I love the hints of cardamom and cinnamon with all of the fresh herbs. Sounds so flavorful! I also hate wasting food so I appreciate the tip for the carrot tops. I’ve been thankful for the organic bins that California provides us so I feel less guilty about things like that. I won’t have that anymore in Georgia though! Oh organic bins are so convenient, Sarah! Seattle offers organic bins, but further North, where I live, we had to press the county for curb side recycling. Many fought it. So, we don’t have curbside composting, unfortunately. I’ve had a worm bin for years, but in the winter it goes dormant. Too bad Georgia doesn’t have curb side. It’s definitely something every state should be participating in. Thank you Amisha! :D I hope you enjoy the recipe! I LOL, Chey! We’re going out again this year too! Hooray! I really look forward to the extended time off … spending time with family and friends. I hope you enjoy the recipe my dear! Thank you for your pin! What an awesome side dish. 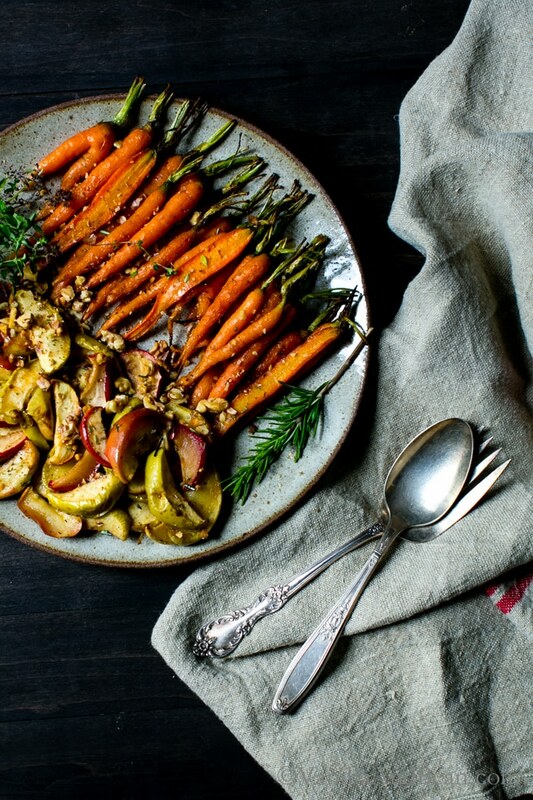 I looove roasted carrots and the addition of apples is simply genius! Oh Traci, i have to make this! I love the beauty and humility of this seasonal pairing and would be genuinely delighted to discover it on a holiday table. 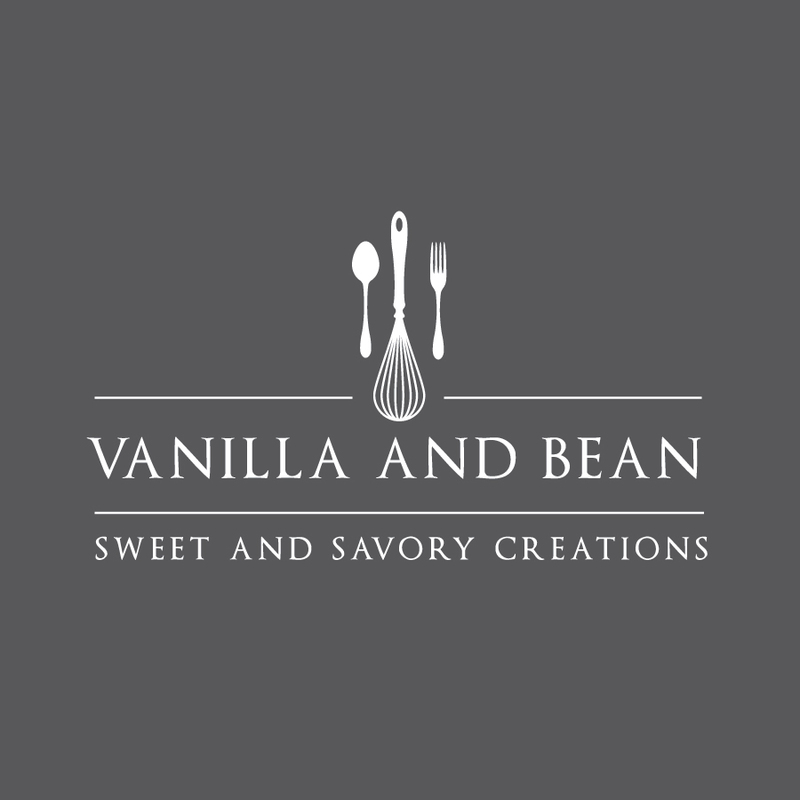 My kind of food… Appreciate the simplicity too – especially during busy seasons when we’d probably all rather be spending time with loved ones than fussing in the kitchen. What a great way to kick off your holiday preps! Keep ’em coming sister (love your moody shots too by the way). Wow, just gorgeous photos Traci, love your eye! 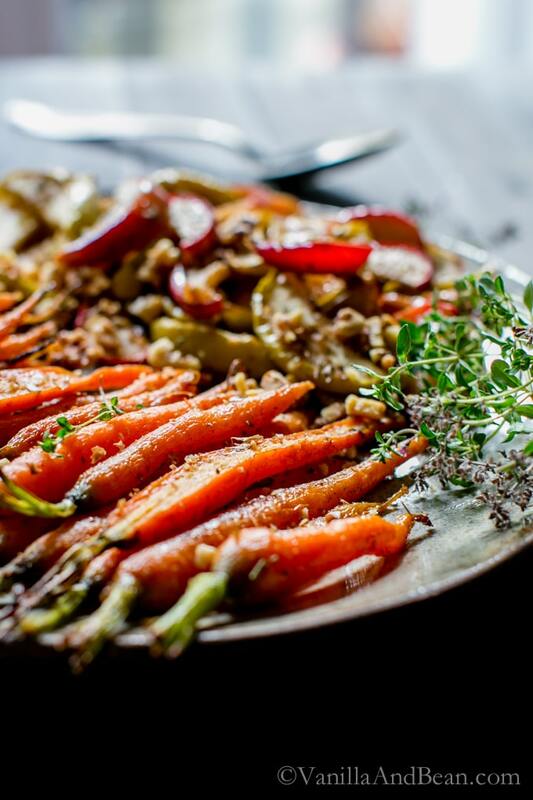 Fantastic use of spices and I love roasted apples with veggies, so good! Thank you, Rebecca! I was thinking the same thing.. So much color! Love simply sides like this, Traci – so attractive and delicious! I read recently a recipe for roasted carrots where you use the carrot tops to make pesto. Love the addition of apples and the spices to the carrots! I’m so looking forward to Thanksgiving – my favorite holiday. Have a great weekend! I’m going to have to give pesto a go… on Instagram, readers are sharing mixed reviews on the pesto, but I want to give it a go, just to see. Perhaps a small batch? Are you hosting Thanksgiving, Geraldine? Hiiii Simone! Thank you for your note! What a great idea, for pesto. I’d love to hear about it if you try it. I asked about it on Instagram and have gotten mixed reviews. Some love the carrot tops in pesto, others don’t. I wonder if it’s an acquired taste? Ohh I’m ALL about the Thanksgiving food! I don’t love Halloween, but Thanksgiving is where it’s at for me :) These are so perfect, combining two of my favorite fall produces! Plus, maple syrup never hurt a roasted veggie, so good! I totally agree Traci! Sounds like an absolutely wonderful combination! I’m always looking for new recipes that include cardamon, one of my favorite spices. Can’t wait to try! Happy weekend! And YAY for Rob for eating those carrot tops!! Lovely photos as usual!! The cardamom really comes through in s subtle way, Mary Ann. I love it so much too! 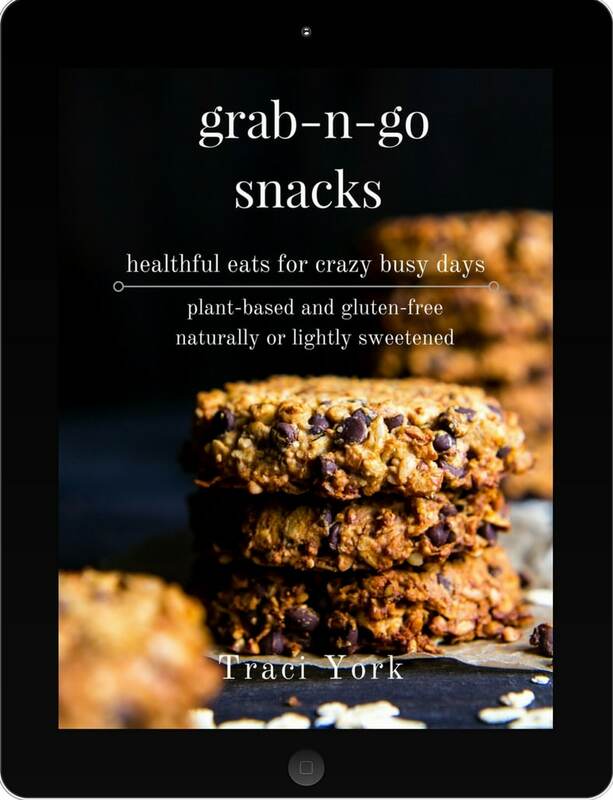 I should have added, thank you for this inspiring recipe & pictures, Traci. Gorgeous, & has me wanting to cook! Can’t wait to try this.